Choice of equipment: Between my ordering Seatern and having to buy the masthead instruments so they could be fitted by Swallow Boats, the price of LED nav lights reduced significantly, so that seemed the obvious choice. 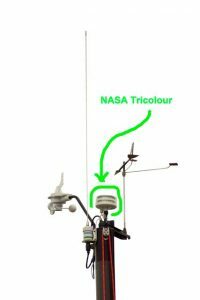 I chose the NASA “super-Nova” tricolour and anchor masthead light to provide my normal navigation lights. However I can’t only have a masthead light. For about 1.5km I have to motor with mast down while I go under Northam Bridge. Although this seems a small distance it includes the entrance to Kemp’s marina, a quay where largish ships load scrap metal, and the waters used by the Southampton Canoe Club who often train in darkness both during winter evenings and early mornings (as do the Coal Porters and Southampton University rowing clubs). I have therefore fitted auxiliary nav lights – “Evoled” Port and Starboard LED lights from Force 4, and LED Steaming and Stern from Baseline Marine – which can be used when the mast is down. Installation: Swallow Boats fitted the masthead light using light-weight 2-core bell wire provided by me which they ran through the mast. The choice between Nav lights and anchor lights is made by reversing the polarity, for which NASA provide a switch. I initially mounted the port and starboard lights on pieces of teak bolted to the lower shroud attachment points. However the jib sheets caught on the lights so I refixed the lights directly to the cabin sides as shown. The best place for the stern light would be the boom gallows but it would be hidden by the mizzen mast if that were erected. I therefore installed it as shown. 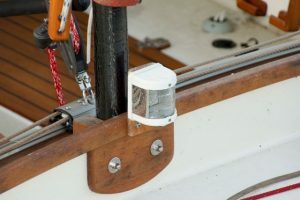 The steaming light looks similar to the stern light and is mounted on a short pole which can be slotted into a flagstaff holder bolted onto the cabin top. It is powered from a 12V socket in the hatch top instruments. The flagstaff holder is also a mount for the fog horn, should it be needed. In Use: No problems so far! For sailing, I wonder if I need the masthead light – the others seem adequate and space fitting everything on the mast top was tight. I also wonder if the nav lights on the cabin sides might be easier to see from a ferry or tug since they would be less likely to merge with the city lights. 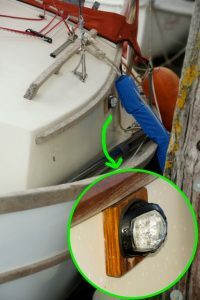 I’ve now fitted a switch to turn off the stern light so that when motoring with the mast up I can used the all-round white masthead light plus the two side lights – legal lighting for vessels under 12m.